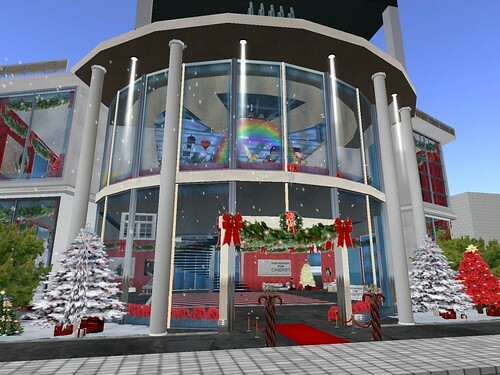 Their project has three components, creating a presence for the organization, training the members of the organization to use Second Life, and hosting a fundraiser to raise funds in order to purchase basic needs items for children. The picture below is one of the vendors that is selling Real Life toys that will be given to children in Austin. Donations range from 50L for toothpaste through 5000L for a comforter. Please stop by and view their work and make a small donation, everything helps! This is an invitation to our Holiday Ballroom Gala Event benefiting ?Partnerships for Children. 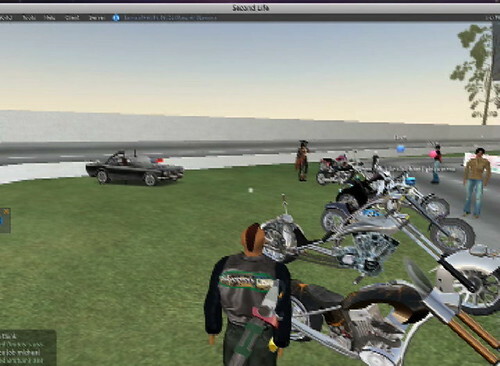 It will be held Wednesday at 4pm(SLT) at the?Educators Coop (http://slurl.com/secondlife/Educators%20Coop%201/74/91/21). It will be formal ballroom attire. We’d ?like for you all to be able to join us in our cause and to help make ?our event a success. How You Can Help: ?You may go to the 2nd Floor of our space and right-click on any item ?that you may wish to donate and click “Pay.” (The amount in $L should ?be the amount in USD$ needed to purchase the item in real-life. We ?will use the money to purchase these items physically and give them to ?Partnerships for Children’s Rainbow Room. We hope to see you Wednesday! ? My students begin spring break today which is great for me because while they all head south to the beaches on South Padre Island I get to stay home in student-free Austin and attend SXSW. 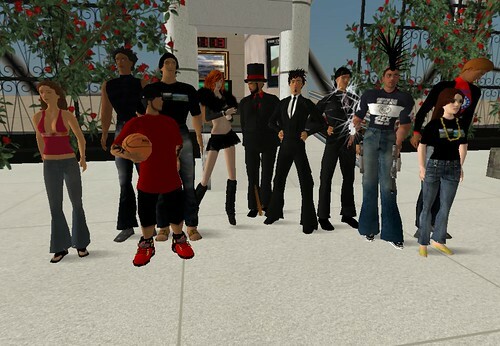 Since we have almost hit the midpoint in the semester i thought now is a good time to share some of the work they have been doing in my Working in Virtual Worlds Class. 7. use a 4096m plot of land and create a scene with a group. #7 was just completed on Tuesday, mind you, they have had weekly readings, weekly 350 word blog posts, and a test already this semester. Here are the instructions i gave for #7. In your teams I want you to create something with your land. You will need a theme, an entry point, some type of navigation, and something interactive or a “feature”. Think back to the tours, Mercedes had a car to drive, Mexico had a pyramid etc.. what will be your group feature? We will spend 15 minutes in your space on Tuesday March 2 so have stuff for us to do. I basically handed over 1/4 sim to four student groups. They have complete access to terraform, build, script anything they want. After a weeks worth of work they created a Winter Wonderland, A Wild West Town, A forest sanctuary, and a tropical beach. I made a quick and dirty 2 minute screen capture of the class on tuesday. Take a look and see what they did. Well tomorrow is my last day of class for Working in Virtual Worlds. Its been a very interesting semester and it ended with quite bang last night at the Custom car and Motorcycle show. The sim peaked out at 62 avatars and many people were sending me IMs trying to get into the show but the sim was jammed pack. The Drag Rats, the student group hosting the event, did a great job networking with the Saints of Hell at Slaytona to organize their event. The live Dj played great tunes and the outfits and dancing were outrageous. I felt like i was at a biker rally. I think the students enjoyed themselves too, it was a perfect ending to our SL experiences this semester. Before the event I was able to take a class picture in SL, a few of the students had already left by the time I remembered to take the snapshot but this is a good sample of our rag tag bunch. I’ll be writing more about the class and my reflections on teaching this semester in the next few weeks as things start to slow down. I’m can’t wait to see the end 0f semester evaluations, the Virtual Team analysis reports, and the final machinimas being completed by the class on December 17.